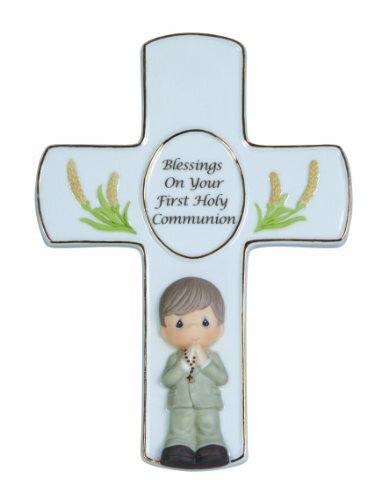 Depicting a young man ready to receive the sacrament of First Holy Communion, this touching cross shares a sweet blessing and includes a stand for easy display anywhere in his room. Sure to keep memories from this special day forever close, while also gently reminding him of his faith each day. The perfect Communion gift for a young man, a keepsake he will always treasure. Meticulously sculpted of fine bisque porcelain and meticulously hand painted. Approximately 7.5 inches high. 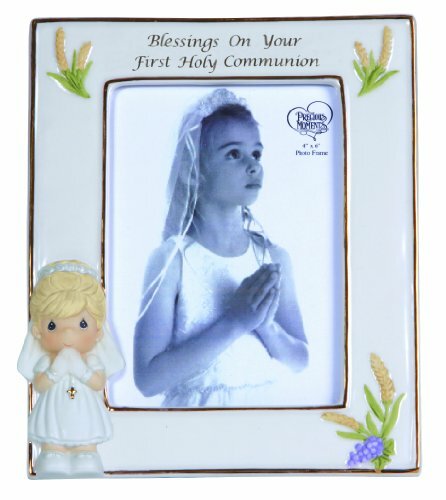 A young girl preparing to receive the holy bread and wine for the very first time graces the front of this photo frame; the perfect way to showcase a 3.5” x 5” photo from her First Communion. Accented with golden paint, this gift becomes a treasured keepsake – a reminder of the day she received this blessed sacrament. 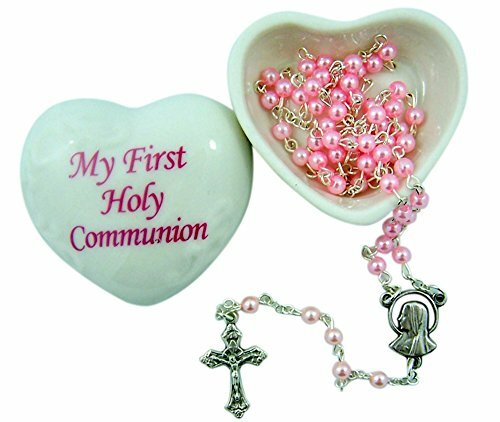 Give this First Holy Communion gift to a special young girl you know who is making this important step in her religious life. Beautifully sculpted in fine bisque porcelain and meticulously hand painted. Approximately 7.25 inches high. Preparing to receive the holy bread and wine for the very first time, this reverent First Communicant prays that Jesus may enter and stay in her heart forever. Accented with a golden cross, this gift becomes a treasured keepsake – a reminder of the day she received this blessed sacrament. 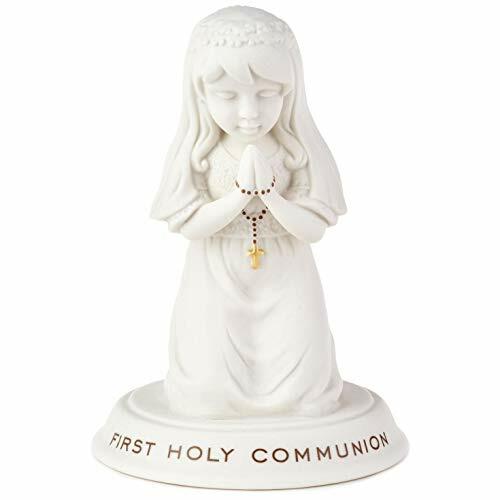 Give this First Holy Communion gift to a special young girl you know who is making this important step in her religious life. Perfectly sculpted in fine bisque porcelain and meticulously hand painted, veil is crafted of fabric. Approximately 4.25 inches high. A pious young man with his hands clasped in prayer graces the cover of this special box with a black rosary inside. A rosary is a time-honored First Communion gift and this one is even more special because of the beautiful keepsake box in which it comes. 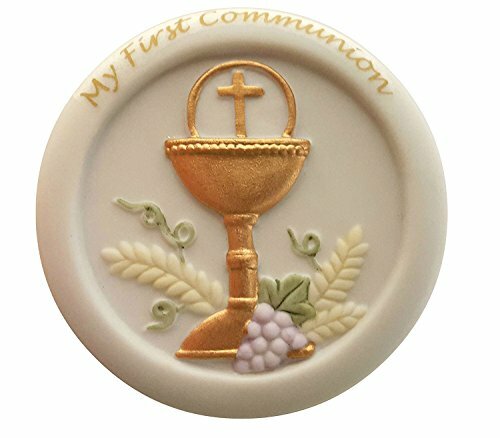 Makes a memorable First Communion present for the young man who has taken part in this blessed sacrament. Meticulously hand crafted of fine bisque porcelain and expertly hand painted. Rosary is metal and plastic. Approximately 4 inches high. 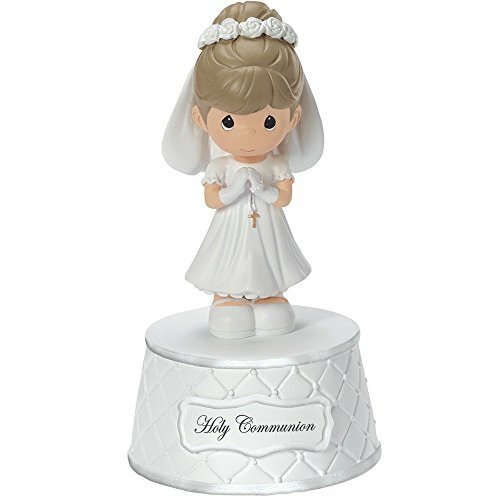 Celebrate a First Communion with this small porcelain statue of a young girl kneeling in prayer with a rosary. Makes a beautiful gift for this blessed occasion. This beautiful keepsake box is heart shaped and made of a delicate high quality glazed porcelain. It measures approximately 3.5 x 3.5 x 2 inches. Perfect for holding jewelry or small keepsakes. Comes in original box. The Lumen Mundi brand stands behind our logo which is a commitment to excellence. Our products are high quality and almost all are made in Italy. Ensuing a quality standard and workmanship that is hard to find these days. 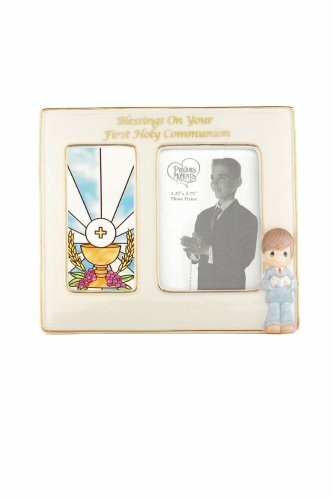 Commemorate one of the most important religious occasions in a young boy's life with this porcelain frame featuring a stained glass effect depicting the Holy Eucharist. This traditional Communion design highlights the chalice of wine and wheat stalks, representing the bread of life. The frame is adorned with a boy dressed in his Sunday best, holding his bible. Porcelain frame is 8" x 7.125" and holds a 3.5" x 5" photo. 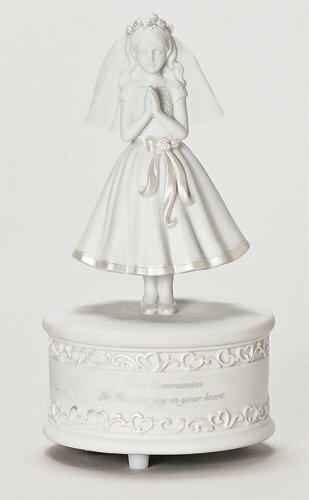 Intricately detailed First Communion figurine with sentiment accented by finilgree design on pedestal footed base. Measures approximately 4.25 x 4 x 7.5 inches. Made of quality porcelain material. Plays melodic tune from 'The Lord's Prayer'; Simply wind mechanism at base of figurine. 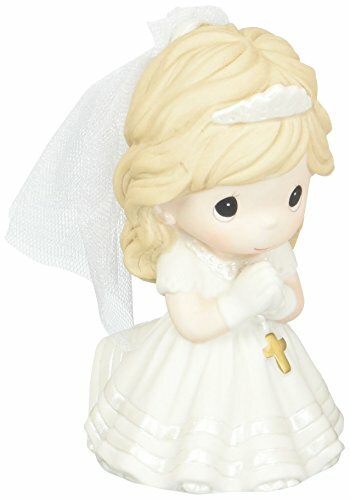 family housewarming grandma mom grandpa dad wife husband best selling idea unique religious catholic gift present christmas birthday church christian cheap discount new spouse parent sacrament wedding confirmation baptism first holy communion. 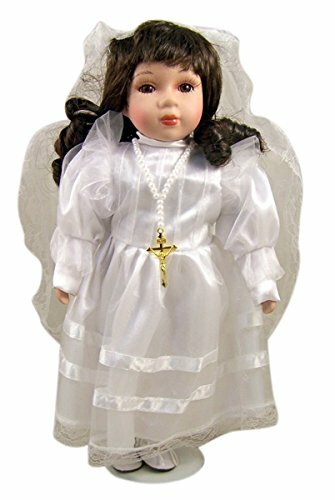 First Communion Porcelain Doll. Stands 12 inches high. The doll is hand painted in a satin dress with crucifix necklace. Stand for the doll is included inside gift box. 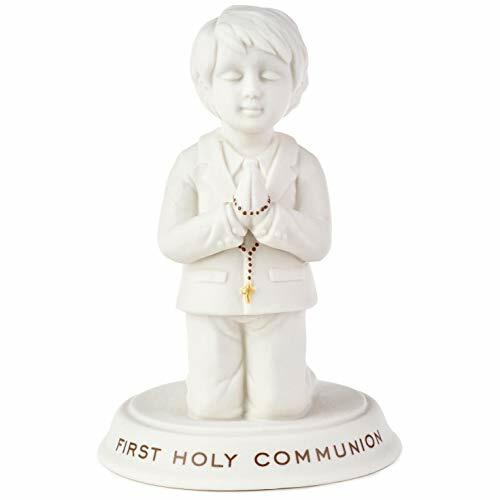 Celebrate a First Communion with this small porcelain statue of a young boy kneeling in prayer with a rosary. Makes a beautiful gift for this blessed occasion. 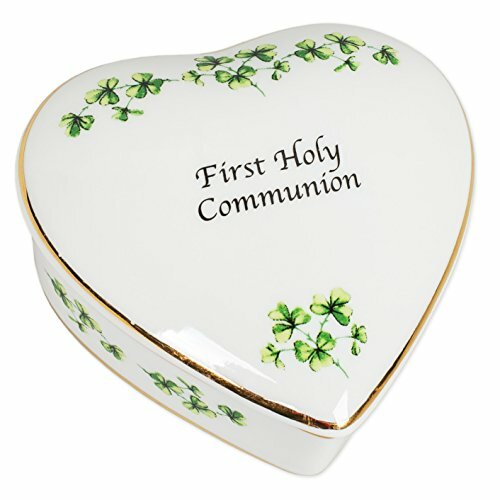 Bless a child on their first communion with this lovely porcelain communion keepsake box. Surrounded with a delicate quilted pattern, this petite and lovely box is perfect for housing a new First Communion rosary or other keepsake. Box measures 1.25" high x 2.25" diameter. This book is about the celebration of the Holy Eucharist. 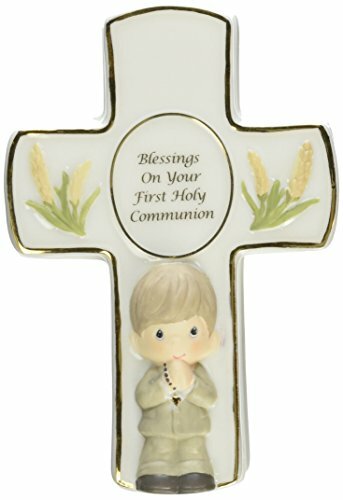 First Holy Communion Porcelain Wall Cross 8.75"
Need a gift for First Communion? The perfect gift for every child ages 7-9 on this most important occasion! This book has the color illustration and textual simplicity to appeal to children around the age of 7, and the charm and respectfulness to appeal to the adult buying the book. Designed with a fill-in page to commemorate the event, and space for a photo to be stuck in, My First Holy Communion contains prayers on the themes of praising God, remembering baptism, coming to confession, taking part in Holy Communion, and living a Christian life. This keepsake concludes with a section of appealing and reassuring blessings and will be welcomed not only as a memento of a special day, but as an encouragement to grow as a Christian throughout one’s life. The elegant bodice feature is made of White poly satin. The waistline is decorated with Your Choice of Color organza sash and ribbon flower to make this dress more elegant. The skirt has 4 layers, the inside layer is satin attached with a netting for additional fullness. the top layer is actually a double layer of fluffy tulle with rose petals and leaves wrapped in it to make this dress more beautiful. Product Description As he prepares to receive the holy bread and wine for the very first time, this pious First Communicant prays that Jesus may enter and stay in his heart forever. Accented with a golden cross, this figurine is a reverent way to mark a special boy's spiritual day. 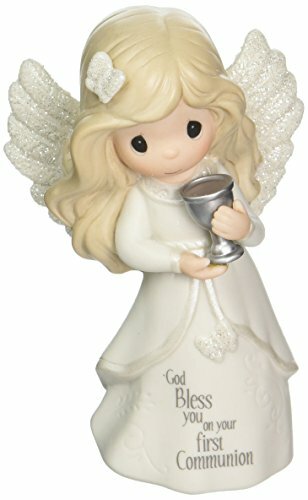 This Communion gift has been meticulously sculpted of fine bisque porcelain and meticulously hand painted. Approximately 4.25 inches high. From the Manufacturer As he prepares to receive the holy bread and wine for the very first time, this pious First Communicant prays that Jesus may enter and stay in his heart forever. Accented with a golden cross, this figurine is a reverent way to mark a special boy's spiritual day. This Communion gift has been meticulously sculpted of fine bisque porcelain and meticulously hand painted. Approximately 4.25 inches high. If you have any further questions, please feel free to contact us. We look forward to serving you in the future. Product Description7'' H. Includes an easel stand. Porcelain cross. 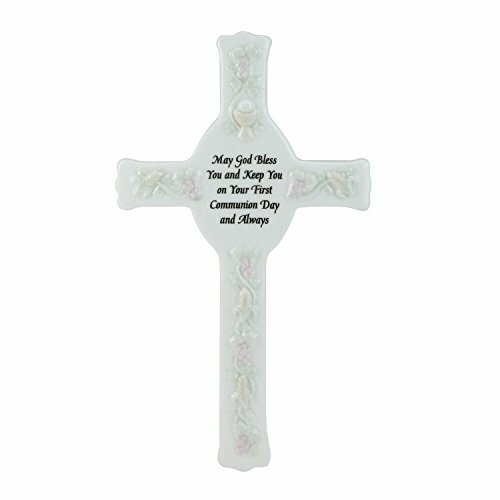 Give a special first communicant you know an unforgettable gift, a cross with a blessing she will cherish forever. First holy communion is such an important rite of passage in the life of a young Christian, as it is an affirmation of her faith.